A little tidbit, while I’m thinking of it. 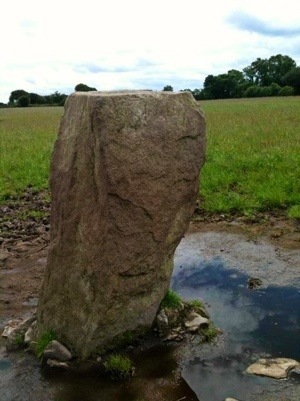 We have several large standing stones on our ridge. The thick, curved variety. One of our neighbors popped in today, to make a massage appointment, and she mentioned a bit of local folklore about these stones. Here in east Cork, those large stones are known as ‘bull stones’. Our neighbor said that when she was a girl, she thought this was because they tied the bull to them…. On the Dingle Peninsula, there was a great assembly held on Domhnach Chrom Dubh in the village of Cloghane. In the old days, the turas (pilgrimage) was made at dawn (1). That would mean a night climb or a vigil on the hill. The ’rounds’ consisted of praying at the ruined oratory and then encircling it and the pillar-stone and the ‘graves’ nine times while saying the Rosary, and ended by taking a drink from the well. When these exercises finished, pilgrims went down the eastern slope to the village, where a famous Patron was held. This Patron (pattern) was begun, tradition says, to commemorate the day on which the pagan Crom Dubh was converted to Christianity. 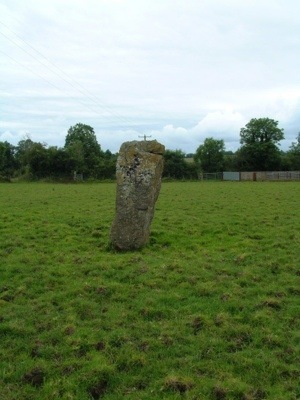 Crom lived at Ballyduff (Baile Dubh), about two miles from Cloghane. A stone carving, formerly kissed as a cure for toothache, in the wall of a local church is said to represent his head. In the OS Name Books for this parish, dated 1841, there is a note indicating that Croum Dhu was the god of the harvest whom pagans worshipped. His conversion legend tells of him slaughtering a bull in order to send the meat as a gift to St. Brendan. 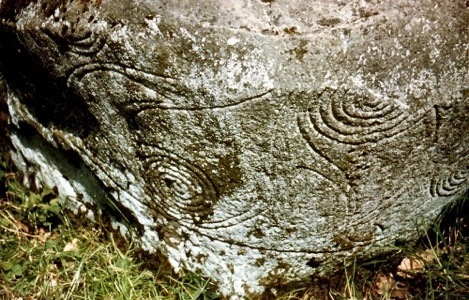 Another story, from Galway, recounts how Crom Dubh (a false god whose law prevailed until Patrick overcame him) was a wild speckled bull (tarbh breac) that killed travelers at Mam Ean: it attacked Patrick, but was driven by him into the lake in which it drowned (Loch an Tairbh – the bull’s lake). In Armagh there is the story of a bull that prevented Patrick from building a church, so Patrick cursed him and he went mad, eventually caught and killed, and buried under a standing stone at Corran. This stone, part of The Bull’s Tracks, was once associated with the bull of Cualgne (from the Cattle Raid of Cooley), which makes sense because originally the bull that defied Patrick (Crom) and the bull of Cualgne were, if not one and the same, at least emanations of the same concept. On an island north of Skye there was a tradition of sacrificing a bull in August, on a day dedicated to ‘going around some ruinous chapels, taking of omens from a hole in a round stone…, adoring of wells and … pouring of milk upon hills as oblations.’ – and the bull-killing associated with a cure for insanity(2). From Cois Fhairrge, we hear of a beef-animal skinned and roasted to ashes in honour of Crom Dubh (harvest-giver and weather-ruler), which the hide carefully preserved. For as we know from many Irish sources, sleeping in a bull-hide was a rite of divination. I have a reference to make here connecting the wild bull as guardian and dream giver, and an essential trial undergone by seekers, but am at a loss to find my citation [NEED CITATION]. 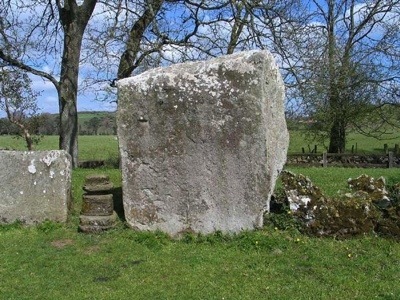 There are several large stones identified as, or with, Crom Dubh (Crom Cruach, Cromm Crúaich, Cenn Cruach, Cenncroithi), i.e.. the decorated stone from a Cavan stone circle, and the large stone at the Grange circle in Limerick. 1. Manuscript of the Irish Folklore Commission 888, 390. 2. Mitchell, A., On various superstitions in the north-west highlands and islands of scotland especially in relation to lunacy.